The Riese & Müller Delite Mountain Rohloff is a very unique, full suspension off-road eMTB. Ultimate in every way; styling, performance, gearing. At the heart of this top of the range eMTB is the Rohloff gearing. Its huge transmission ratio is over 520%. With 14-speed hub gears this puts the Delite Mountain Rohloff in a class of its own. The Rohloff is for both pros and performance oriented hobby cyclists. It’s reliability is legendary. The Rohloff boasts perfect single gear ratios. Also worthy of note is its ultra wide range of gears, low maintenance and easy operation. Its weight and efficiency are ideal even for pro racing. The sealed gearbox ensures reliability and durability even under the toughest conditions. The even increments of 13.6% between gears make it possible to ride continuously at peak performance. The overall range makes sure that you always have access to the right gear regardless of situation. Pure fun is always a given. Make no mistake, the Rohloff is practically bullet proof, maintenance free and represents the ultimate in gear shifting. 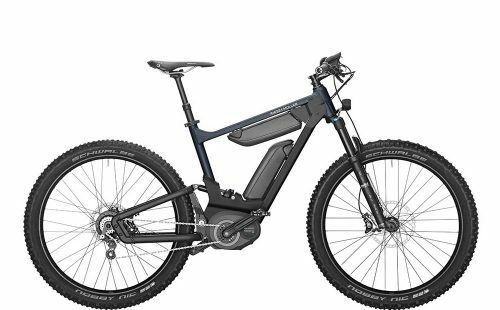 The new E-14 from Rohloff now features on the Delite Mountain Rohloff and synchronises perfectly with the Bosch eBike system. One push of a button is all it takes to automatically reduce motor force upon the transmission and shift the SPEEDHUB. Furthermore, of the button is held down, the E-14 shifting system will shift 3-gears at a time in sequence, through all 14 gears if so desired. In addition, once the sensors note the cyclist has become stationary, the E-14 system will automatically shift to a pre-programmed gear to start off again. Now as standard on all Delite ebikes is 1000Wh of battery capacity, provided by 2 x 500Wh Bosch PowerPacks. This full suspension eMTB boasts a plethora of high quality components. The front suspension of the Delite Mountain Rohloff is handled through a nice set of Fox Float 34 Performance Boost Air forks with120mm travel. The rear shock is a Fox Float DPS Performance with 3-postions, fully adjustable to match the needs of any terrain. Schwalbe Nobby Nic 70-584 fat eMTB tyres on Rodi Tryp35 27,5″ rims provide huge grip, strength and durability. A JD dropper seatpost ensures a low seating position, essential for all those tricky downhills. A highly responsive set of Shimano Deore XT disc brakes ensure effective stopping in all weather conditions. The optional ABUS Bordo Plus Alarm is a new feature providing enhanced security at all times. In addition, an extremely bright 1,250 Lumen Supernova M99 Mini front light is a real asset and illuminates the trail ahead. The Delite Mountain Rohloff from Riese & Müller is indeed a dynamic eMTB with superb performance and a unique set of features to match.